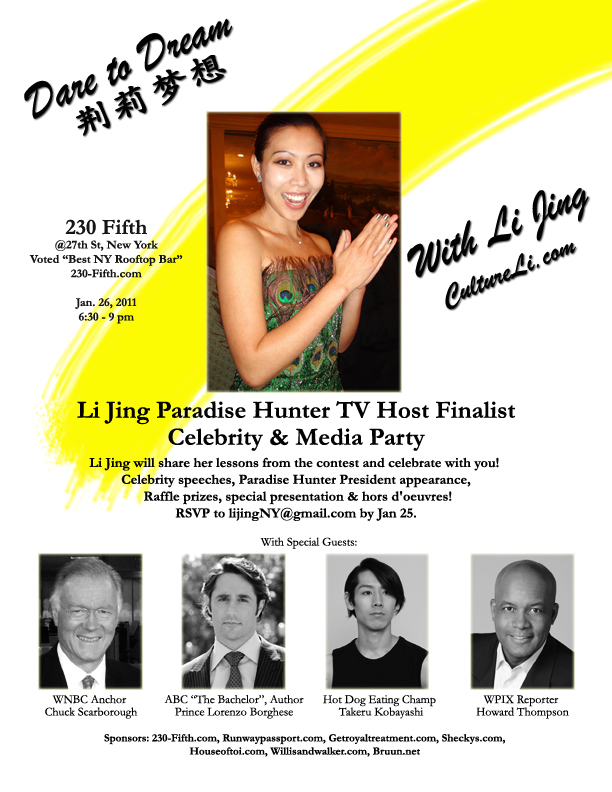 Award winning TV host, social media expert, model, and founder of CultureLi, Li Jing will host the “Dare to Dream” International Celebrity and Media Reception to celebrate her selection as a finalist of Paradise Hunter Global TV Host Contest. Li Jing will have a final interview with the President of Paradise Hunter, Dennis Kambeitz. The event will be held on January 26, 2011 from 6:30 to 9pm at famous New York City rooftop bar 230 5th on 27th Street and Fifth Avenue. Celebrities and guests will help create a “Dream Book” at the event by writing down their favorite inspirational quote. Li Jing will share her experience from the contest, how to use social media and China background to win two rounds of voting and become the #1 voted New Yorker and top 2 in the world. Li Jing’s youtube video was viewed over 20,000 times. She will also speak about her unique experience of receiving an offer from KODAK on twitter after New York WPIX TV “HELP ME HOWARD” show. Major global media including China Daily, China News and Sina.com have covered Jing’s story. As the only Chinese immigrant in the finalists, Li wants to encourage people to follow their dreams despite obstacles in life. There will be a special presentation with celebrity speeches, raffle prizes, & hors d’oeuvres! Top American and Chinese media, TV, fashion and business leaders will attend. Some of her confirmed celebrity guests include NBC anchor Chuck Scarborough, ABC’s “The Bachelor” star Prince Lorenzo Borghese, WPIX reporter Howard Thompson, fashion designer Zang Toi and Hot Dog Eating Champ Takeru Kobayashi. No user commented in " International TV Host to Celebrate with Top US and China Celebrities and Media "